Founded in 1989, GCV is internationally recognized as a distinguished maker of fine stringed instruments and bows ranging from fractional size instruments for beginners to superior master instruments and bows for advanced and professional players. Today, GCV instruments and bows are being distributed by top musical instrument companies in over twenty countries in Europe, America, and Asia. Two VSA silver medals for tone, and numerous international awards and certificates, GCV instruments are differentiated by their outstanding tonal quality for instruments at all levels. 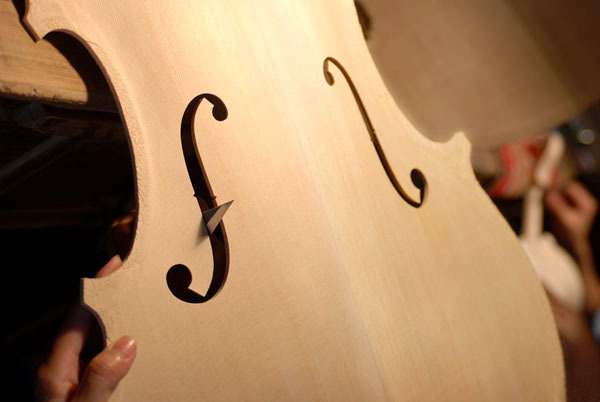 Violin makers at GCV are mentored by renowned luthiers from Italy and Germany and are committed to constructing the best possible instruments. Bows from GCV are made in the Guan’s Workshop led by internationally acclaimed master Shang C. Guan who won the gold medal for bow in the 1990 International Violin Competition. Bows are skillfully crafted using traditional French methods and select materials. Every item GCV makes is a testimony of its commitment to quality, standard, and integrity. COPYRIGHT © 2008 GUANGZHOU CREMONA VIOLIN CO. LTD. ALL RIGHTS RESERVED.